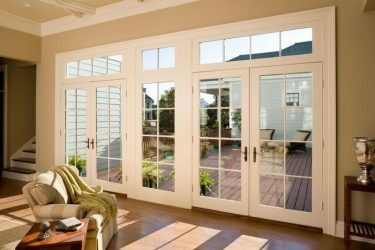 If you are in the market for new windows, then Interstate Windows may be a great choice for you. Interstate offers a unique line of windows called Compositwood Windows. The Compositwood by Interstate line is not only durable and efficient, but also looks exceptional. It is a great way to add to the curb appeal of your home, and increase the overall value as well. These windows are among a new generation of windows. Compositwood windows are a lot like wood in their appearance, but they require a lot less maintenance and upkeep. It is made up of acrylic resins and polymer. It is more solid than real wood, but still gives you the same look and feel. 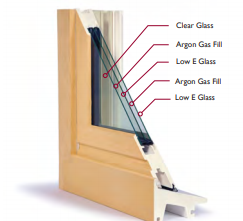 This technology allows you to have energy efficient windows that are durable and look amazing. Compositwood windows also weather the elements very well. The outer shell of the windows is made up of something called a SuperCap, which is a sealant that protects the window and helps them to last longer. It also keeps them from being damaged by harsh weather conditions. Interstate windows come with their own fair share of benefits. First, they are superior to other materials and help to cut back on the amount of energy that is transferred through them. THis makes them much more energy efficient, and even allows them to exceed the criteria for the Energy Star Performance ratings. This can help you cut your utility costs as well. The Compositwood windows also help to cut back on draftiness, as all of the sashes and jambs are sealed with a compression seal. This keeps the harsh weather out, and the cool air or heat inside depending on the time of the year. Aside from having great practical benefits, it can also help to enhance the appearance of your home if you replace your windows with Interstate windows. Get the look of real wood windows, without the hassle that comes along with them. Finally, these Compositwood windows by Interstate are not really that hard to keep up. You can clean them easily, and operate them easily, with premium hardware and other features. This is an added benefit. Any time you invest in home improvement projects, you will want to make sure that it is a wise investment. This means that durability needs to be a priority. The good news is that the SuperCap surface that coats these windows really does help when it comes to durability. This can make them more weather resistant, and can also help them to repel moisture and rotting. It is also safe from damage done by pests, such as termites. These windows are also really strong. They will not crack, peel, chip or chalk over time. This means that they will stay looking newer for longer. The Compositwood materials that are used in these windows really make them much more stable than other materials. For instance, they are well over 500% more durable than fiberglass windows, and 400% more durable than hollow vinyl windows. This is something to consider. Any time you get a new window, or really any new type of home improvement product, you will want to check into the warranty information. The good news is that Intertate windows are backed by a lifetime warranty that covers all manufacturer’s defects and workmanship. This basically covers if anything goes wrong with the windows, under the assumption that they are used normally and according to specifications. To ensure that your windows are properly warrantied, make sure that you have them professionally installed. If they are installed incorrectly, it could actually void your warranty. This is why it is so important to find a professional in the window industry. Here at Hatch Homes, we have the skill and expertise it takes to get the job done right. 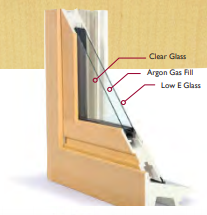 Compositwood windows actually surpass the Energy Star rating specifications. These windows are certified by AAMA and NFRC. They also got the Most Efficient mark from Energy Star back in 2016. 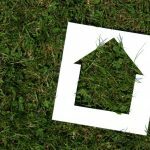 What does this energy efficiency really mean? First, the U Factor must be considered. This is the measurement of the rate at which the window transfers heat. If it has a lower U value, then it will be more insulating. Along with looking at the U factor, it is also important to look at the K value. This is the measurement of how much heat is allowed through to the colder surfaces. A lower K value is also important when it comes to the overall energy efficiency. Interstate gives you a lot of options when it comes to their Compositwood windows. One of their most popular is the Tilt-In Double Hung window. This window offers a classic wood look and feel, but has a solid core frame that offers the most when it comes to durability and performance. The sills are sloped to allow the water to run off. They are also very easy to clean. Another option you may consider is the Horizontal Slider window. This window slides horizontally to open and close. It also has a solid frame, adding to the strength and durability of the window. Casement and awning windows are another popular choice. They have a lower profile, and they do not get in the way when it comes to your blinds. They do, however, require you to have some space to allow them to open and close freely. 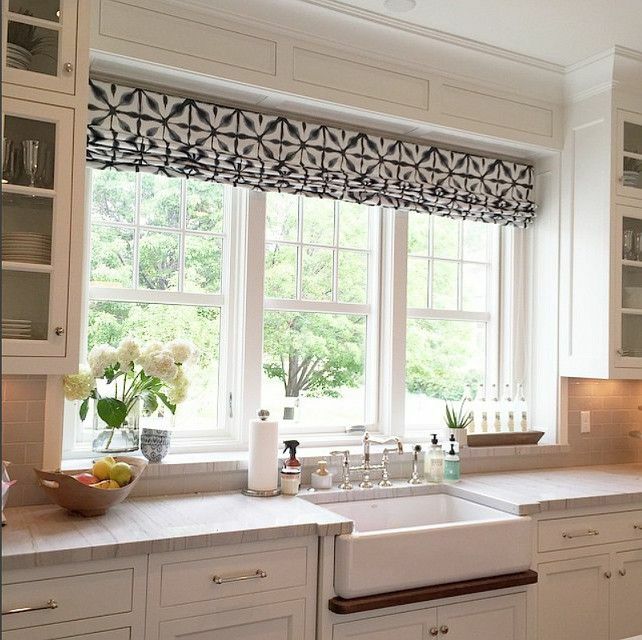 Picture windows are another type to consider. 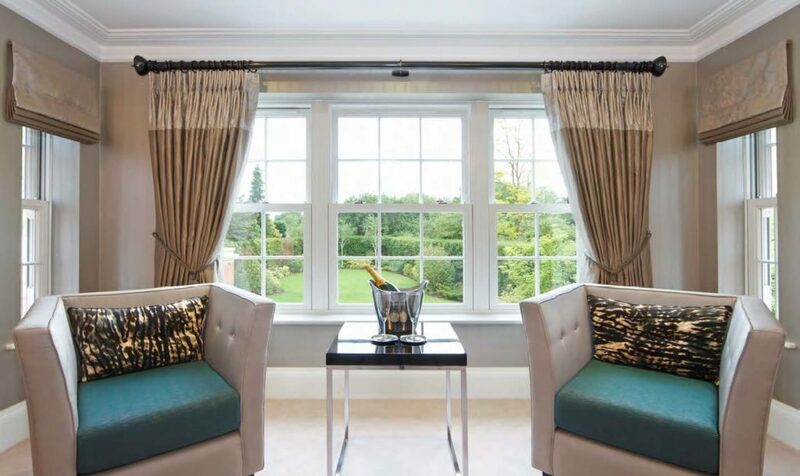 You can choose from three different designs to make them match your other windows in your home. They are secured tightly, and look very visually aesthetic. 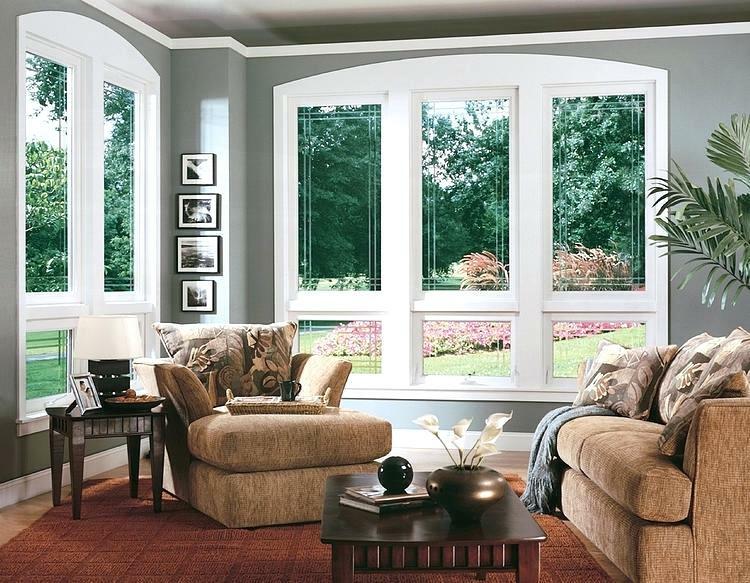 For those with bay and bow windows, there are options for you as well. There are two different interior finishes to choose from, and are very easy to install and seal. They are also pretty maintenance free, unlike many other bay and bow windows you find on the market these days. No matter what size or shape of window you have, you are sure to find an Interstate window that will work for you. The sky really is the limit when it comes to the windows that Interstate has to offer. Since most of their windows are made to custom measurements, you really do have a lot of option. 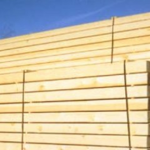 CompositWood® provides excellence in performance with the rigid pre-finished SuperCap™ surface, it has the lowest thermal conductivity compared to competitive window frame materials. 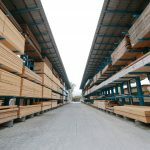 CompositWood can be chemically or fusion welded to create superior, weather-proof joints – unlike fiberglass, aluminum or wood that require mechanical fastening and sealants that can fail over time. Due to the chemical makeup, the window is also recyclable friendly. BACKED BY A LIFETIME WARRANTY Interstate’s CompositWood® windows are lifetime warranted against defects in material and workmanship under normal use and service. The color of your windows is also rather important when it comes to the overall curb appeal of your home. The good news is that you can choose from a variety of different colors for both the inside of the windows and the outside of the windows. 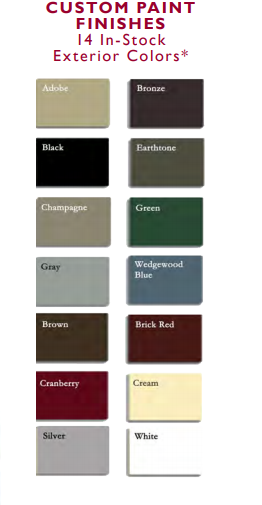 There are 34 different custom exterior colors, mostly neutral, and they can be applied on top of the SuperCap finish. There are also 14 different in-stock custom paint finishes that you can choose from. 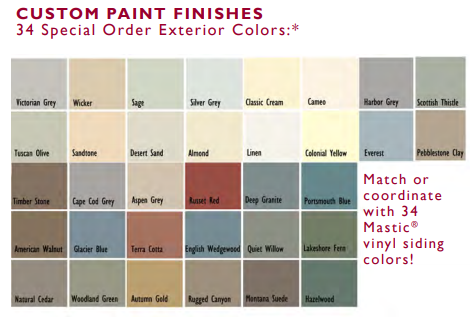 Even if you don’t see a color that matches your needs, you can have the colors custom blended to get just about any color that you could need to match your home decor. Aside from choosing your window frame colors, you can also choose from several different types of hardware. There are white, adobe, brushed nickel, bronze, and brushed brass options. No matter which color you choose, you will find that the hardware is built to last. All operators, hinges, and locks are designed to work seamlessly together without problem. Interstate Compositwood windows have some of the highest performing hardware on the market. Finally, you will need to decide on a type of grid. There are a few different grid options for you to consider. The grids will help to make your windows look better, and give your home a better curb appeal. You can even choose Grids Between Glass, which will allow you to clean your windows easily. When the grids are on top of the glass, it can be difficult to clean in between each grid. This is why a lot of homeowners opt for the grids to be placed between the glass, making them more maintenance free. This, however, does make it look less like multi-paned glass. If you want the windows to look more natural, Simulated Divided Lites on the surface of the glass may be a better choice. Just know that it will be a little harder for you to keep the window panes clean. This really is just a matter of preference. +All values based on 2.3 mm glass pane thickness. Results may vary with different glass thicknesses, tempered glass, grid applications and other specialty glass types. CUSTOM PAINT FINISHES Unlimited Color Match Exterior Colors Custom blended colors available to suit your design needs – limited only by your imagination! All CompositWood windows arrive with the industry’s finest hardware system. The operators, locks, and hinges have all been developed to work together to meet or exceed industry performance requirements. CompositWood utilizes only the strongest, beautiful design, easy to operate and highest performing hardware available in the market. COMPOSITWOOD® Grids add a specialized look to your home’s curb appeal. Grids Between Glass (GBGs) afford easy cleaning. 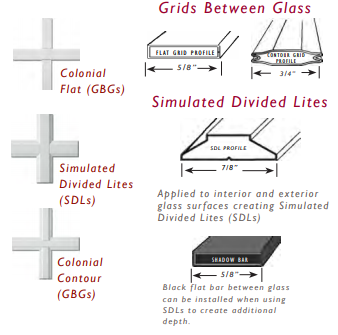 Simulated Divided Lites (SDLs) are permanently adhered to the glass panes inside and out and are designed to look like a true multi-paned window. When it comes to finding the right contractor to install your Interstate windows, you don’t want to skimp out. The truth is that not all contractors put as much effort and attention to detail into their projects. When Hatch Homes installs windows, you can rest assured that it is done by a certified craftsman with a great deal of experience. Contact us today for more information about Interstate windows, or to get an estimate on your project. ENERGY STAR was created to help consumers easily identify products, homes, and buildings that save energy and money, and help protect the environment. As the government-backed, trusted symbol for energy efficiency, the ENERGY STAR label identifies highly efficient products and designates superior energy performance in homes and buildings. ENERGY STAR qualified windows today are, on average, twice as efficient as the average window made ten years ago and can help reduce your energy bills significantly. Products that are recognized as the Most Efficient of ENERGY STAR in 2016 meet rigorous energy efficiency performance levels set by the U.S. Environmental Protection Agency. CompositWood has been awarded the ENERGY STAR Most Efficient mark for 2016. The AAMA VMC members include manufacturers of windows, doors, skylights and related building products and their component and material suppliers. Collectively they advocate the development of voluntary technical standards, extrusion, profile certification, marketing, green and sustainable fenestration products and educational programs.